Celebrate the Year of Youth in 2018 with us! The Australian Catholic Bishops Conference have invited all of us to join them in celebrating a Year of Youth from the end of 2017 (December 3, 2017) until the end of 2018 (November 25, 2018)! 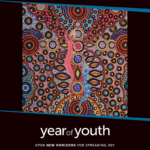 The Year of Youth image is titled Christ our Joy and was painted by artist, Amunda Gorey in Alice Springs. You can access the image here. And check out the Brisbane Catholic Education website here for more Year of Youth resources.